I know I'm on a bit of a Chanel love-in at the moment, but I wanted to just post a few quick words about some new perfumes being launched in a couple of weeks in early March (I'm also away at the moment and it's handy to have some pre-prepared & pre-scheduled posts ready to send out in case I don't get time to write a brand new freshly-reviewed-item post :-)). 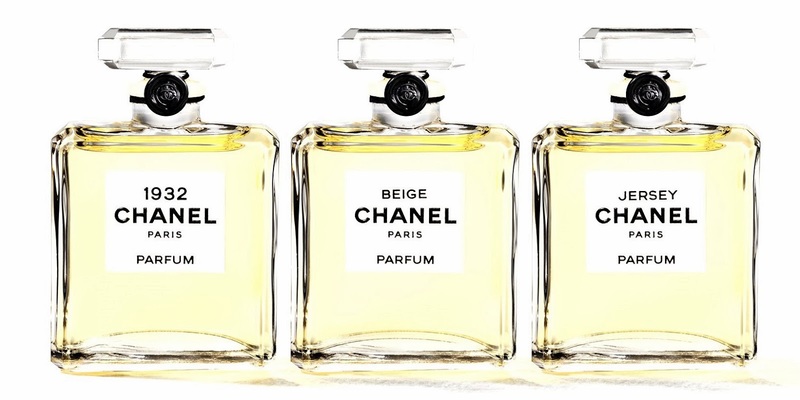 Chanel are turning three of their Exclusifs de Chanel EDT fragrances into Extraits (perfumes). Some of the Exclusifs range are already available in both EDT and perfume formulation, these three are new joiners. The three in question are 1932, Jersey, and Beige. Of course, turning an EDT into a perfume isn't just a question of removing the alcohol content - so, as you'll likely already know, if you own both a perfume and an EDT in a particular fragrance, the resulting Extraits won't be exactly the same scents as their EDT versions - but a reproduction of the essence of the EDT, if that makes sense. Or scents. Or... ok I'll stop punning now. I've already posted about this scent in EDT form - look here. The 1932 EDT was released in 2013 and is a fruity, floral, woody scent comprising notes of grapefruit, neroli, iris, rose, jasmine, musk, sandlewood and vetiver. The perfume/extrait version is based around jasmine, imbued with iris and vetiver and joined by pear and grapefruit accord. I had wanted to like the EDT version of this one, as on paper it sounded like it ticked all the boxes for me - however it really wasn't my cup of tea as it transpired. So I'll be curious to see if the Extrait version might do the trick instead. Released in 2009, the Beige EDT is a Floral scent with powdery and honeyed effects of jasmine, ylang-ylang, hawthorn accord and the aniseed and almond facets of mimosa and linden. The perfume/extrait version sounds like it's going to be even more floral, and will be largely based around jasmine and may rose absolute. Jersey EDT was released in 2011 and features lavender, vanilla, tonka bean and musk, in what a lot of people consider a unisex scent. The perfume/extrait version sees the lavender joined by jasmine and may rose absolute, and the vanilla and musk have also been significantly increased to soften any sharp notes and make a smoother scent than the EDT, but largely still this sounds like it will remain neither a particularly masculine nor feminine fragrance. These will be on counter from the 7th of March - exclusively available from the Brown Thomas Chanel Boutique in Dublin, rather than the Chanel makeup counter, in case you're looking for them. At €186 (yikes!) for 15ml, these are not cheap, but then again perfume usually isn't. Probably not for me, but not everything is for everyone. I will be taking a sniff at 1932 just to compare with the EDT ok, purely out of interest. Back tomorrow with some new makeup product reviews - I have heaps lined up... cream eyeyshadows, new lippies, purchases while away, new hair toys and lots more!